The apartment is ideally located, overlooking the Museum of Romanity and facing the entrance to his garden. Enjoy from the terrace beautiful evenings, moments of relaxation, the exceptional programming of the Roman Arenas of Nimes nearby (100 meters), the Museum of Romanity and gardens (opposite!) or simply from the historic city center! Right next to the Roman Arena, the Museum of Romanity and 150 m from the shops of the historic city center. 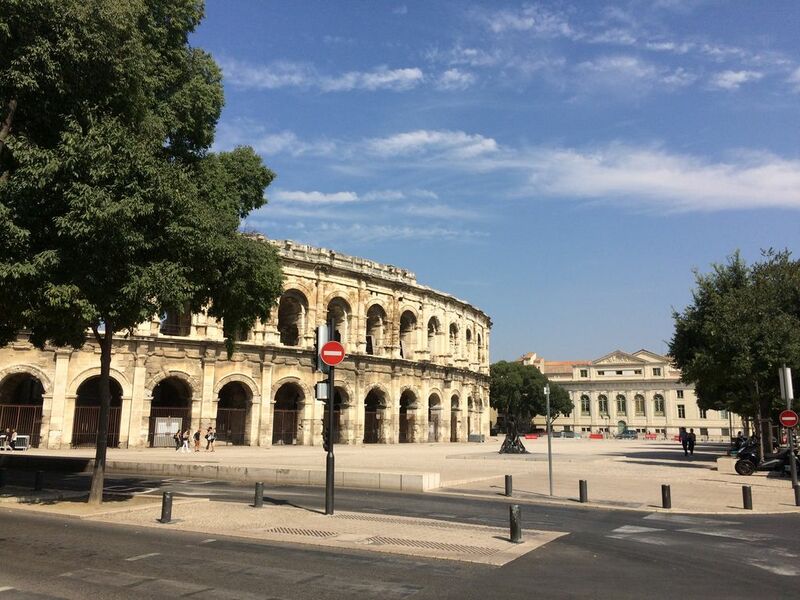 The area is quiet but alive and has just been renovated by the city of Nîmes. A large volume is waiting for you with a mezzanine and the living room with sloping ceilings, with a surface of about 80m², the housing was completely redone in spring 2016 to give space and cachet. It has a reversible Daikin group for air conditioning or heating. It is equipped with a convertible air conditioning. Enjoy 2 or family of its terrace on the roof for a moment of tranquility or conviviality out of sight. Two rooms, an attic in mezzanine with visible stones and wrought iron composed of a bed in 160 and a in 90, the second independent with bedding 160. There are 7 beds with the sofa bed very comfortable, but this place is more suitable for 4 or 5 people because we have a single bathroom and a small kitchen, unless you prefer to enjoy the restaurants of the city! The apartment is crossing, very quiet side courtyard on the one hand and on the other hand on a small street that comes from a pedestrian zone! The apartment has views of the Museum of Romanity (under construction). Summer at the Festival is also possible to enjoy many concerts from the terrace. Parking spaces in the street (long-term rate zone about 4 € for the day or underground parking nearby (300m). I could bring you information on the good Nîmoises tables or the local shops and craftsmen. ... passionate of Camargue I am at your disposal to discuss with you. Fully equipped kitchen: Nespresso coffee machine, induction hob, dishwasher, microwave, fridge with small freezer. Bathroom with hair dryer and towel dryer. Nearby (50m) you have a pharmacy, a supermarket, a pastry shop and almost at the foot of the apartment a grocery store of local produce and early. For ladies who wish to enjoy a holiday to talk, a manicure is 10m. Hair dryer, towel dryer, towels are provided.